I'm Down with the syndrome…are you? That’s me, practically hurdling the toilet paper display to tell you your baby is beautiful. I see you in the grocery store. I peered into the carseat, and I saw beautiful almond shaped eyes, a little flat nose, tiny ears. It’s taking everything I have not to hug you. I want to tell you that I know. I want to tell you I am so happy for you, but you won’t understand yet. You’ve just begun your journey. I don’t tell you it will be difficult and no big deal at the same time. That soon, you will sometimes forget the Down syndrome. It will become an afterthought. One day you will realize that you went the whole day without thinking about it, and that will happen on more days then not. I don’t tell you that you will be so thankful. That he will make you a better parent. A kinder person. I clench my teeth so I don’t shout that your world is expanding – that he will teach you to see people in an entirely different way. I want to say, you are as strong as you need to be. That whatever comes your way, you can handle it. I want to tell you that you will learn as you go, that it will be alright – better than alright! I want you to know all of this. Probably, you aren’t ready to hear it now. It’s too much for someone who might still be grieving. You wouldn’t believe me. So, I tell you your baby is beautiful, and I mean it. He is. I hope you can tell I mean it, because in this very grocery store, over by the deli counter, a mother told me my baby was beautiful – a gift. I could see she meant it. Now I know all the things she didn’t say. I remember her sincere joy at seeing my little girl, and now I understand she had her own different but beautiful baby at home. 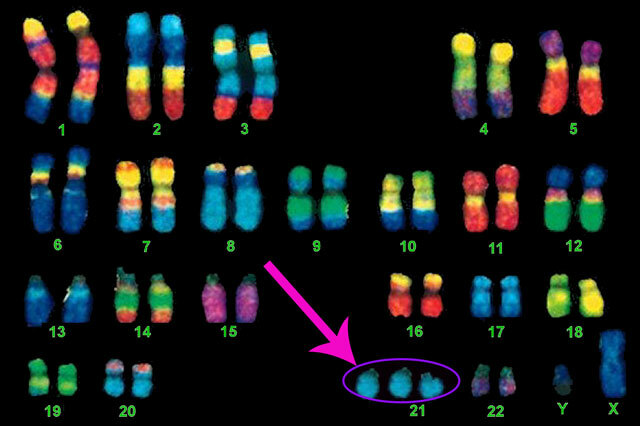 The 21st chromosome affects up to 2% of a person’s overall DNA. That may be small, but it is not known entirely what that 2% affects. How integral is that extra copy of the 21st chromosome to who my daughter is? It obviously shapes her beauty. How does it affect her view of the world, her personality? Yes, Evelyn is so much more than Down syndrome, but it is certainly a part of her – one that I would not change, because then she wouldn’t be Evelyn. I did not always feel this way. When I was pregnant, even through her infancy, I would have jumped at the opportunity to “cure” Evelyn’s Down syndrome. It certainly would have made her life and our’s easier. Then, as Evelyn grew into a toddler, her personality emerged and I began to understand her more. I came to realize Down syndrome is not an affliction to be cured; it is not a disease. True, some health issues sometimes associated with Down syndrome can be life-threatening, but the syndrome itself is merely a collection of symptoms – most of which have no lethal inclination. Life without Down syndrome might be easier, but I am certain it would not be better. On the contrary, I believe Down syndrome has improved my life, as I have written before. I wouldn’t want to eliminate that extra chromosome because I think it would fundamentally change who she is. I will, however, do anything I can to improve her life. Evelyn wears orthotics to help train her muscles to work against her low tone and increase her mobility. She has ear tubes to improve her hearing, allowing her to use all of her senses to learn. Evelyn participates in early intervention services that provide physical, speech and occupational therapy. All of this is intended to help Evelyn achieve the fullest life possible – hopefully one of independence and inclusion with her peers. I recently read about a study which concluded the third copy of the 21st chromosome limits the amount of a specific protein in the brain. This protein helps neurons to work properly. With this knowledge, the scientific community is one step closer to thwarting the effects of Down syndrome on the brain’s ability to absorb and store information. I can’t help but be hopeful that soon there will be a safe, effective therapy to grant Evelyn the ability to learn and retain much more than her current capabilities. A treatment that would allow her to learn to drive a car, graduate from college, and live independently. Of course, some people with Down syndrome already do all of these things, but it is not the norm. I don’t believe this would change who she is, essentially. Certainly, it would make her life easier. Better? Maybe. I’m open to the possibility – as long as she is still Evelyn. Get down with the syndrome. Lots of people are looking up from here. Catch up with the syndrome. They’re down with the syndrome. Looking Up With Down Syndrome Blog at WordPress.com.